There are over 2,000 species of fireflies, or lightning bugs. They are easily spotted by the light that is produced in the belly area. When we think of light we imagine fire, but this bioluminescence comes from within and produces no heat. Many creatures have biological characteristics that are designed to attract mates or prey. This winged beetle has a flashing light to serve this purpose. In spirituality, an inner light stands for enlightenment and the firefly is a shining example of this miracle. 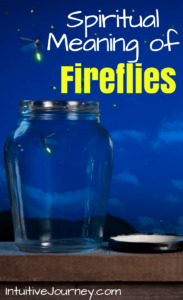 There are no infrared or ultraviolet frequencies in the light that is produced by the firefly. Fireflies produce a “blue light”, symbolic to wisdom, inspiration and healing, a gift from the gods. What better way to compare an inner glow of the heavenly spirit than with this small insect’s miraculous light? It can be almost impossible to believe in that which cannot be seen. An inner spirit is not able to be physically manifested, but is present, just the same. The firefly acts as a metaphor of that little light that shines in all of us if we just believe. As hard as it may be to believe in a Higher Power, it can also be difficult to believe in a light that is manufactured from internal organs. However, this is just what occurs with the firefly. There is no manmade source to justify its intense light, just a creation from God that abounds with a higher wisdom than mankind. Scientists may be able to explain what the chemical makeup is that produces a firefly’s inner glow, but how it was created will always remain a mystery to those that seek a material answer in nature. Believing in the unknown and the good intentions of a superior being is shown to us in many subtle ways. The firefly is a good example of the unseen presence that exists within all of us. This is a spiritual gift that offers the wisdom of knowledge. The next time that you see a firefly as the day turns to dusk, think of how you can increase your spiritual abundance. The Universe provides abundantly for those that believe with an infinite flow of resources. If you liked this post, I’d love for you to “PIN IT”!